Banana blueberry muffins are a big hit at our house. My husband finds the addition of blueberries made my regular banana bread more moist so I have been making them this way ever since. Preheat your oven to 350 degrees. Prepare muffin tins with paper liners- see recipe below for suggested number of muffins. Cream the shortening and sugar with the back of a wooden spoon. Add the mashed bananas and and eggs. Sift the flour, baking soda and salt into the banana mixture and then add milk and stir. Add 1/2 to 3/4 C blueberries depending on your preference. Stir gently. 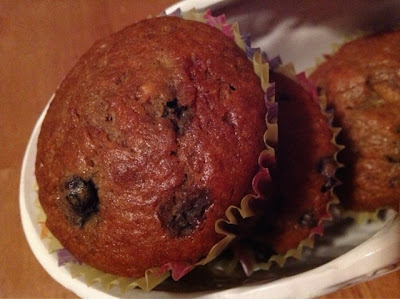 Pour batter into muffin cups- I usually make 1 dozen regular size muffins and 6 mini-muffins. (If not using cups, grease your muffin tins with shortening.). Fill cups nearly to the top.